Our headline was taken from this Dec. 23rd article at i100 (The Independent’s BuzzFeed–style website) by the site’s news editor Matthew Champion. 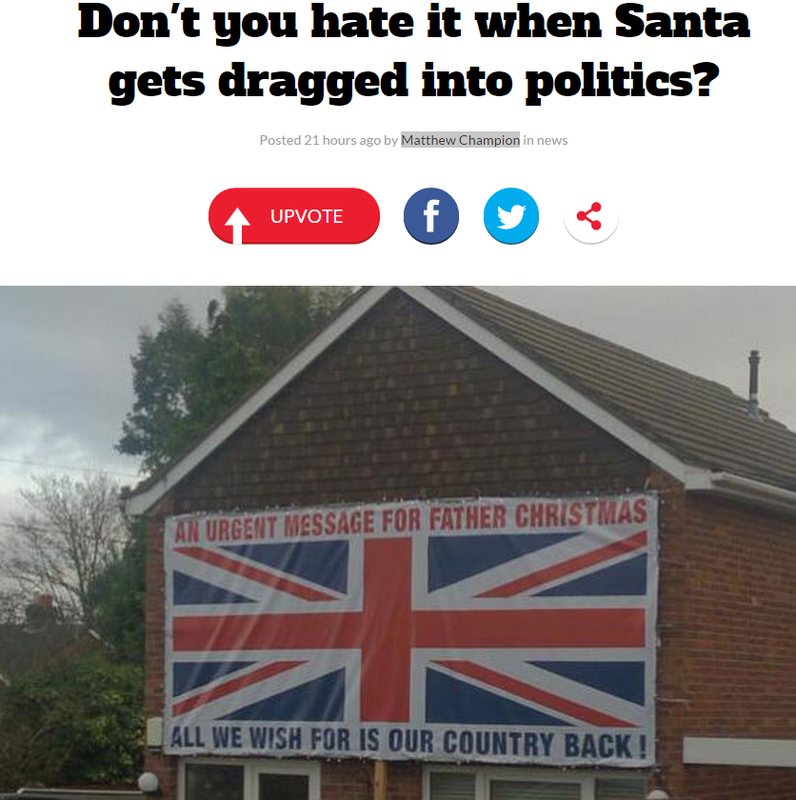 Whilst you can read the brief article (ranked 3rd overall in popularity on the site) here about the flag – displayed in Hedge End, Hampshire – we were even more intrigued by another trending article on the site (ranked 6th overall) posted by Champion on the very same day. It was evidently lost on Champion that that his i100 story about a clash in Bethlehem between Palestinians and Israeli soldiers – yet another example of the UK media’s tradition of Bethlehem themed anti-Israel narratives during the holidays – represents exactly the kind of political exploitation his other story decries. Here’s a snapshot of i100’s sidebar, which provides a better view of Champion’s double standards. 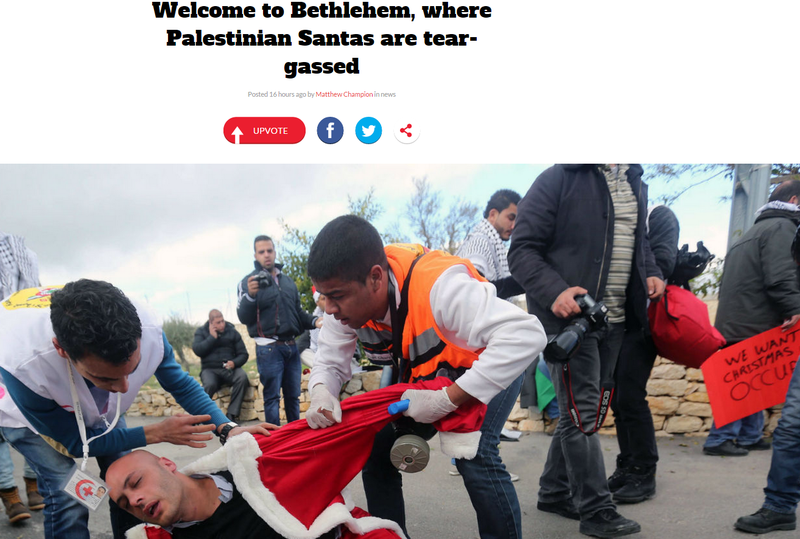 The article about the ‘tear-gassed Santa’, which consists of a mere 54 words and a video, also quite naturally neglects to note that the protesters faced tear gas only after they threw rocks at Israeli soldiers. Here’s another photo from Champion’s piece. 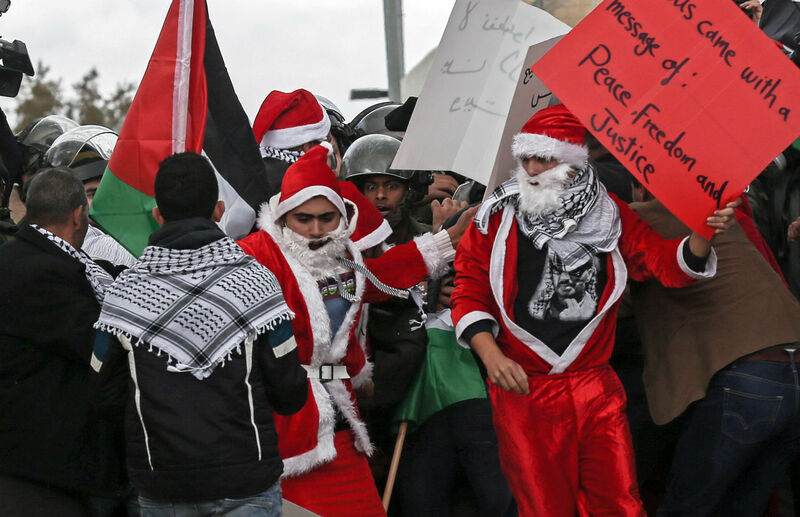 Don’t you just hate it when the media amplifies cynical efforts by Palestinians to smear the Jewish state by exploiting Jesus and the Christmas holidays? Merry Christmas from the Holy Land! I would like to take this opportunity to wish all those I agree with, you know who you are, Seasons Greetings and may next year bring you Peace, Health and Happiness. To all those I disagree with, you also know who you are, Ho Ho Ho go and screw yourselves you scum-sucking excuses for human beings. I consider myself being in the “agree with” category so I wish the same – Happiness, good health and a lot of fun on Cifwatch. I know who I am. Season’s Greetings to you too Gerald! The same to you, pathetic excuse for a prosimian. Don’t you hate it when there are more press than actor’s? anti Christian voices in Lebanon. Will Al Guardian pick up the story ?